Psst. Come here. Ya, over here. I wanna talk to you about something. Just keep it down, alright? It’s a little sensitive so I don’t want others to hear this. It just … well, it can make people uncomfortable, ya know? Hell, I’m uncomfortable talking about it. But I gotta tell somebody. I have no idea what to do and I can’t just ignore it and hope it goes away. That’ll do me no favours, never mind who I’m talking about. And that wouldn’t be right. I mean, just cuz something’s awkward doesn’t mean you don’t do the right thing, right? So here’s the deal. I’m worried about my bank. Something just isn’t right. Their behaviour is just, it’s, oh boy, they just seem different, somehow. I can’t put my finger on it exactly, but it’s like they’re no longer themselves, sometimes. Ah, geez, how do I say this delicately? I think they’re, you know, losing it. Upstairs. Mentally. I think my bank is going senile. I mean, how else do I explain their refusal to take their money back? On the surface my bank seems perfectly healthy. Their signs, as green as Augusta fairways, dot strip malls and adorn office towers like beacons of wealth across our expansive nation. They also pop up south of the border including, not surprisingly, on an NHL hockey arena like friendly, inanimate Canuck peace ambassadors. Why, they even have four close friends doing much the same in a rainbow of red, blue, gold, and maroon badging providing Canadians and the world a comforting bosom in which to nuzzle its accumulated treasures. In return for this patriotic work, my bank, and likewise its friends, is rewarded most handsomely. Absurdly handsomely. Genetically engineered super-human clone of Brad Pitt, George Clooney, Sean Connery, Paul Newman and Chris Hemsworth handsomely. It earned $6.6 billion on revenues of $27.3 billion in 2013 alone. I’m not sure any combination of genetic material from the most desired human males in all of history could rival such a degree of handsomely. In fact, I’m positive my bank could shut their doors for a full year, pay all their employees to undergo plastic surgery transforming each and every one into replicas of the Monopoly guy, then reopen to the fanfare of $10 grand prize winning beauty pageants in each branch and they’d still be sufficiently profitable to warrant inclusion in every Canadian’s RRSP portfolio. So yeah, at first glance everything appears perfectly fine yet I can’t stop worrying. Something just isn’t right, ya know? And hey, my bank may not like to hear this but it is getting up there in years. It is 160 years old! There’s bound to be a little slowing down in the cognitive faculties by that age. One day you and your executive assistant are happily skinny dipping into mountains of profited money stimulating each other with tales of intricate tax evasion anecdotes. The next day you’re refusing to let a fiscally prudent, modest family give you your money back. It happens to the best of us. Now, granted, I have been a bit disingenuous. My bank isn’t entirely refusing to take their money back. They will do so, begrudgingly, so long as I include a pecuniary care package consisting of a prepayment charge and a reinvestment fee. But is this still not itself a cause for concern? Are these fees not suggestive of encroaching senility? Why, exactly, does a bank need to charge me a reinvestment fee? They’re a bank. This is what they do. They tell millions of Canadians how to invest their money every single day. Are they themselves paying for outside advice on what to do with the money I wish to return to them? That would be a little weird, would it not? Maybe get their kids wondering if it’s time to take away the car keys? It’s not like there is a shortage of mortgage or loan applicants in this country. Canadians are accumulating new debt with the same reckless abandon that Hugh Hefner swallows little blue pills. Just put up another swanky green sign saying “Have Money – Will Loan” on it and wait for the stampede to the front door. I’ll even help you out, dear bank. Take back your money and let me keep my $300 reinvestment fee and I’ll give you a phone book full of people who’ll happily take your money from you again. Then there’s this prepayment charge. What an audacious perversion of logic to penalize someone for alleviating you of risk quicker than initially agreed upon. The bank is charging me a penalty to give them their money back too soon. That’s like you borrowing my lawnmower and me penalizing you for returning it before my lawn needs cutting again. Of course, they also charge you if you give their money back too late, though they’re far more accommodating of this indiscretion. No worries old friend, my lawn can wait a few more days before cutting. No big deal, really. Meanwhile your yard mysteriously keeps getting larger the longer you have my mower. The most bewildering part of this prepayment penalty, though, is that the bank itself cannot provide me with a definitive dollar amount for the charge. 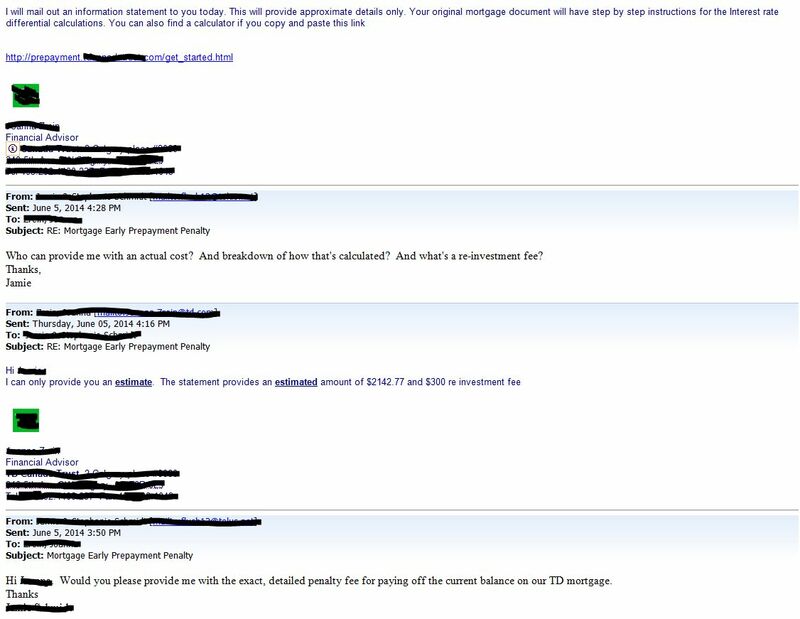 I contacted my mortgage representative (financial advisor by title) at my local bank branch to inquire what the exact penalties would be if we repaid early. To the right is her response in which she twice iterated that she could only provide an estimate of the penalty. 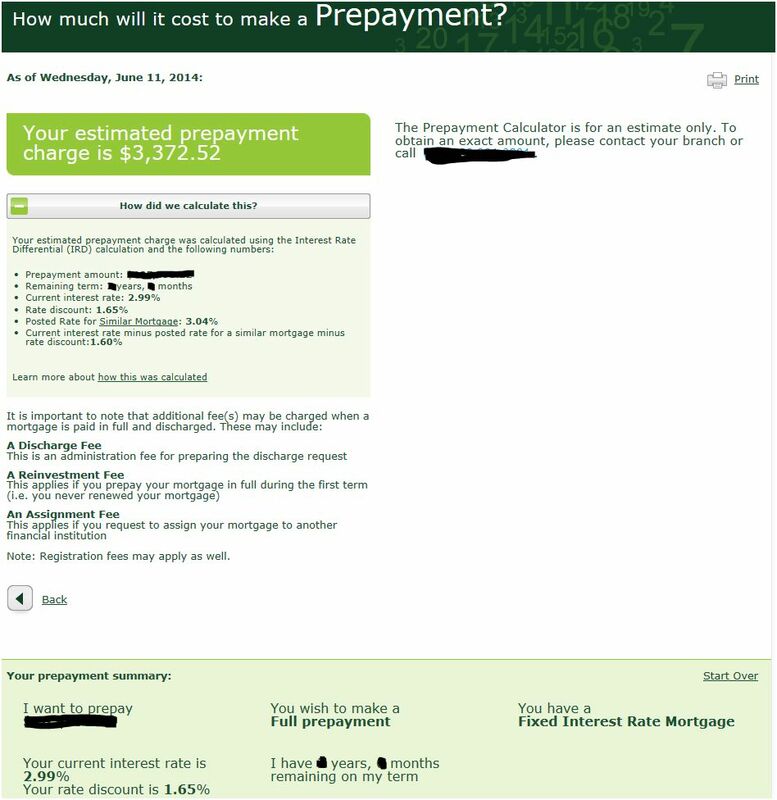 She also graciously enlightened me to the fact that there is a detailed calculation provided in my original mortgage documents that allows me to calculate the penalty myself (it remains unclear if my calculation would also constitute an estimate only) plus a link to a handy-dandy, do-it-yourself online penalty calculator. See? The bank is even making me do its work for it. It’s as if they know they have lost a step and are delegating routine tasks to save face. 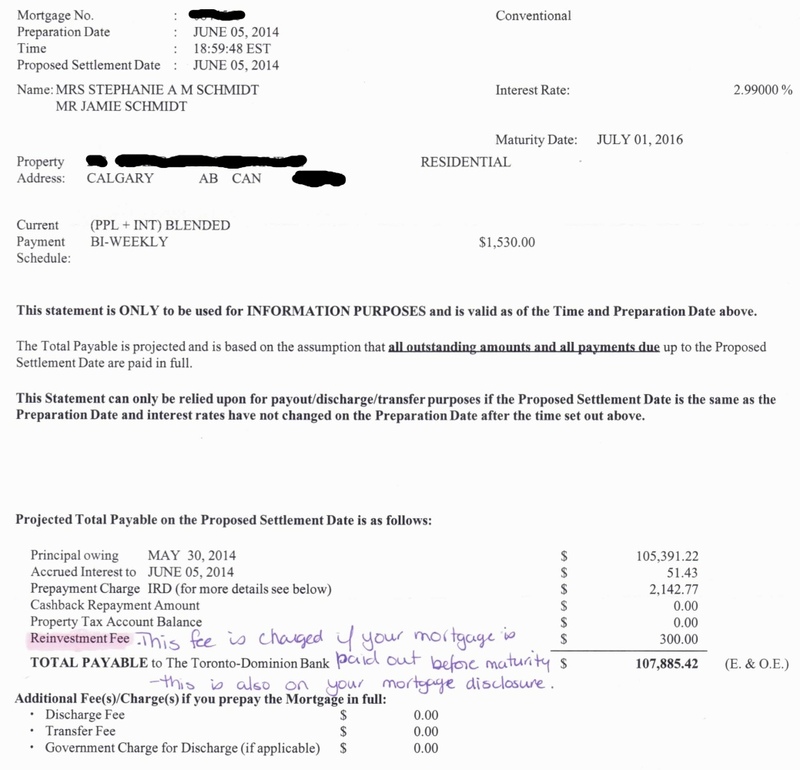 The promised letter did indeed arrive with the anticipate approximation of the penalty charges and to the surprise of no one ever the penalty would be slightly more than the interest owed if I were to simply pay out the mortgage on schedule. Brilliant! 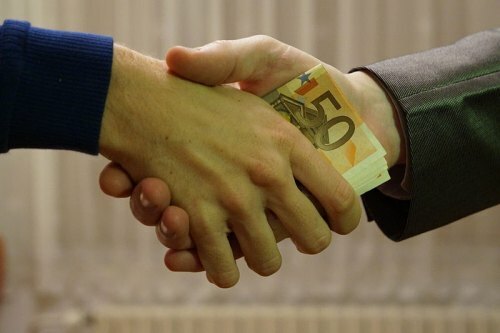 I give you back your money plus what I would have paid you anyway PLUS a fee to find someone else to give it to and you’ll call it even. I’m starting to understand where that $6.6 billion in earnings comes from. Furthermore, I’m starting to question my even thinking this bank was going senile. The bank hasn’t lost its marbles; they’re the genius mob boss faking infirmity to avoid prison. And just to bring this full circle and shake a little salt on my indignation wounds, I did attempt to calculate the (estimated?) prepayment penalty using that handy-dandy (which is code for mystifying) online calculator and came up with a value more than 50% higher than the one given to me by the bank. I can assure you I won’t be sharing my results with the aforementioned mortgage rep. Additionally, my first attempt using the detailed calculation on the back of my mortgage documents provided yet a third equally variable result while also confirming my wisdom in avoiding a mathematical related career. This all occurred almost a year ago. I eventually, okay quickly, gave up, preferring to stew over this blog post for eleven months. This was likely the hope of the bank all along. Except for the blog post part. I doubt the bank reads my blog. Though it might now. This post alone will surely give reason for an upwards curl at the corner of its lips. Maybe even a tingle in the trousers. Look, I realize this reeks of ‘first world problem’. Hell, a lot of first worlders would love to have this problem so I guess it’s got more of a 1%er stench. We have been very lucky. I also take pride in our being in this situation. Good fortune has certainly played a role in but we also worked hard, spent cautiously, and wisely didn’t buy a house requiring every penny of mortgage the bank pre-approved us for. This fact seems lost on a good many Canadians but a pre-approved mortgage is not like an antibiotics prescription; you don’t have to use it all. So yes, we are at least a bit deserving of this enviable position we find ourselves in. I just wish our prudence was rewarded or at the very least, not penalized. There was a time when vigilant borrowers were a banker’s dream. Today, debt derived cash flow is a lusted after commodity by our banking system and serial debtors are thus held in high regard. This is not healthy or sensible. And when corrupt systems fail they tend to cause a lot of collateral damage. Far more than $300 of reinvestment advice will cover.